This research brief is the second of a two-part analysis that presents information on children adopted from foster care in the United States and their families using data from the 2007 National Survey of Adoptive Parents (NSAP) and the 2007 National Survey of Childrens Health (NSCH). This brief presents information on post-adoption supports and services including adoption subsidy payments, and Medicaid coverage, and other services such as support groups for parents and children. This brief was prepared by Karin Malm, Sharon Vandivere, and Amy McKlindon at Child Trends under contract to ASPE. The Federal Project Officer was Laura Radel. 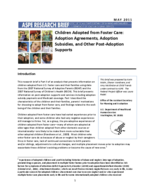 This research brief is Part II of an analysis that presents information on children adopted from U.S. foster care and their families using data from the 2007 National Survey of Adoptive Parents (NSAP) and the 2007 National Survey of Childrens Health (NSCH). This brief presents information on post-adoption supports and services including adoption subsidy payments and Medicaid coverage. Part I described the characteristics of the children and their families, parents motivations for choosing to adopt from foster care, and findings related to the well-being of the children and their families. Children adopted from foster care have had varied experiences prior to their adoption, and some children who had very negative experiences still manage to thrive. Yet, as a group, the pre-adoptive experiences of children adopted from foster care many of whom are adopted at older ages than children adopted from other domestic sources or internationally are likely to be make them more vulnerable than other adopted children (Vandivere et al., 2009). Most children who enter foster care do so because of abuse or neglect by their caregivers. Once in foster care, lack of continued connections to birth parents and/or siblings, adjustments to cultural changes, and multiple placement moves prior to adoption may exacerbate these childrens existing problems or become the cause of new ones. The NSAP includes children adopted from foster care, from other domestic sources, and from other countries. However, this series of briefs (part I and part II) focuses specifically on children adopted from foster care. For a detailed examination of all types of adoptive families please see: http://aspe.hhs.gov/hsp/09/NSAP/chartbook/index.cfm. The National Survey of Childrens Health (NSCH) is a nationally representative survey of U.S. children under age 18. In each sampled household, one child under age 18 was randomly selected. A parent or guardian knowledgeable about the childs health answered questions by telephone regarding the childs and the familys health and well-being and provided information about demographic characteristics. The 2007 NSCH includes information on 91,642 focal children, representing 73.8 million children throughout the United States . For more information about the NSCH, please see: http://www.cdc.gov/nchs/slaits/nsch.htm. Post-adoption supports and services are often provided to children adopted from foster care and the parents who adopt them. Such financial and non-financial assistance is provided for two main purposes: to help maintain and support children who have been adopted from foster care, and to help families with parenting challenges, especially those that are unique to adoptive parenting. The availability of such supports may also play a role in recruiting adoptive families for foster children, especially for parents who may worry about their abilities to meet childrens future needs (NACAC, 2008). Adoption assistance from the federal government is administered under the federal Title IV-E adoption assistance program. Payments to the parents of an eligible child with special needs can take the form of either one-time (nonrecurring) adoption assistance or ongoing (recurring) adoption assistance. These funds are paid through the state agency or through another public or nonprofit private agency and are available for children being adopted from foster care. The recurring assistance, in the form of monthly adoption subsidy payments can, under recently enacted federal law, continue until the child reaches age 21. The monthly payments also follow the child from one state to another, if the childs family moves. The NSAP included several questions about monthly adoption subsidy payments, that is, ongoing adoption assistance. In addition to a monthly subsidy payment, children adopted from foster care may receive a variety of post-adoption support services, such as child care, mental health counseling, or tutoring. More than nine out of ten children adopted from foster care (92 percent) have adoption agreements with the public child welfare agency. Children adopted by parents who were related to the child and those adopted by non-relatives are equally likely to have an adoption agreement. The same is true for children adopted by former foster parents and those adopted by parents who had not fostered. Adoption agreement, health insurance coverage, and monthly subsidies: Parents reported whether they had an adoption agreement at the time of their childs adoption. Such agreements may include monthly maintenance payments from the agency, medical coverage, and other services such as therapy. For parents who reported that they receive a monthly financial subsidy or whose child was covered by public health insurance, we examined whether these supports were part of the adoption agreement. Medicaid coverage for medical, dental, and mental health services was examined. Among children with adoption agreements, 73 percent have an agreement with a monthly subsidy payment written into the agreement, and 70 percent have Medicaid coverage (or other public health insurance) and a monthly subsidy payment. Eleven percent of children with an agreement have an agreement that includes Medicaid coverage but no adoption subsidy. Subsidy payments are intended to assist parents in meeting the special needs of their adopted children and to encourage the adoption of children who would otherwise be difficult to place in adoptive homes. States define criteria relating to special needs, but in addition to special health care needs typically include children from racial or ethnic minority groups, older children (with the definition of older varying by state) and sibling groups adopted together. Note: Values corresponding to unreliable percentage estimates have been suppressed in this figure. Adoption subsidies are generally provided on behalf of children without the adoptive parents having to request the payment. Specifically, for 84 percent of children, the subsidy was provided without their parents having to ask the agency. Fifteen percent have parents who requested it because they could not have afforded to adopt the child otherwise. Information about the availability of subsidies may come from various professionals. Eight percent of children adopted from foster care have parents who requested the subsidy at the suggestion of a social worker, and four percent have parents who requested it at the suggestion of an attorney. Parents who were foster parents to the child prior to the adoption indicated whether the adoption subsidy payment was higher, lower, or the same as the monthly foster payment. Among children adopted from foster care whose parents had previously foster parented them, slightly fewer than four in ten (39 percent) receive an adoption subsidy amount the same as the foster payment, 32 percent receive an adoption subsidy amount higher than the foster care amount, and 30 percent receive an adoption subsidy amount lower than the foster care amount. These percentages do not include those children whose parents received a foster care payment, but currently receive no adoption subsidy. If they were, the percentage of children who receive an adoption subsidy that is lower than their foster care payment would be higher than 30 percent. Higher payments may in part be the result of inflation adjustments made to families payments since the time of the adoption. Adoption subsidy payment receipt, amount, and whether or not the subsidy payment meets the childs needs vary by a number of child, parent, and family characteristics. Children adopted from foster care who were placed in the adoptive home prior to one year of age are less likely to receive a subsidy payment than children who were 1 to 5 years of age or older than 5 at the time of the adoptive placement (64 percent compared with 84 percent and 90 percent, respectively; see Figure 4). However, the likelihood of receiving a subsidy greater than $500 does not differ by age of placement. Neither the receipt or amount of the subsidy payment differ by whether the child has special health care needs. Among children with no birth siblings or no known birth siblings, the percentage receiving an adoption subsidy (50 percent) is lower than for those with birth sibling(s) also adopted by their parents (87 percent) or for those with birth siblings not adopted by their parent (76 percent). Children in families in which there are other adopted siblings (regardless of the biological relationship of those siblings) as well as children born to the adoptive parents are more likely to receive an adoptive subsidy than children in homes in which they are the only child or in which there are adopted siblings but none born to the parent (86 percent compared with 69 percent and 68 percent, respectively). A higher share of children living in households with incomes at or below four times the poverty threshold receive a subsidy payment than do children living in households with higher incomes (83 percent compared with 56 percent). However, among those that do receive subsidies, the amount of the subsidy does not different between the two groups of children. Subsidy receipt also differs by childrens race and Hispanic origin. The percentage receiving a subsidy is higher among non-Hispanic African American children than among non-Hispanic white children (85 percent compared with 69 percent). This is likely due to states definitions of special-needs adoption that frequently encompass children of color, as well as older children, sibling groups, and children with medical conditions or disabilities, as being harder to place for adoption (NACAC, 2008). There are some differences in whether the monthly adoption subsidy payment meets the childs needs depending on child and family characteristics. Foster children placed with their adoptive families before the age of 6 are more likely to have parents report the adoption subsidy meets the needs of the child than children placed at age 6 or older (71 percent compared with 52 percent). Among those receiving a subsidy, the likelihood of receiving a subsidy greater than $500 does not differ depending on whether the child is older or younger than 6 when placed for adoption, or on whether or not children were related to their parents prior to the adoption. According to data collected by the North American Council on Adoptable Children (NACAC), amounts of adoption subsidy payments differ substantially across states (NACAC website, 2010). Similarly, evidence from the NSAP indicates that the amounts of adoption subsidy payments vary by region of the country. Specifically, the percentage of children adopted from foster care receiving monthly payments of more than $500 is higher for those in the Northeast than for those in the Midwest or South regions (62 percent compared with 34 percent, and 27 percent respectively; see Figure 6). Overall, three out of four of all children adopted from foster care (75 percent) have an adoption agreement that includes Medicaid coverage (representing 81 percent of all those with an adoption agreement). Children who had been eligible for federal foster care subsidies prior to their adoption and whose adoption assistance agreements are provided for under title IV-E of the Social Security Act are categorically eligible for Medicaid until age 18. The NSAP also collected information on childrens use of Medicaid for medical (including hearing and vision), dental (including orthodontia), and mental health services. Among all children adopted from foster care, nearly two out of three (65 percent) have ever used Medicaid for medical care, over half have ever used it for dental care (55 percent), and nearly one out of three have ever used it for mental health services (32 percent). Those who have never used Medicaid for such services include those not covered by Medicaid as well as those who used other sources to pay for care or who never received such services. Some children who have an adoption agreement that includes Medicaid were also covered by private insurance. Overall, 59 percent of all children adopted from foster care are covered by public health insurance, while 37 percent are covered by private health insurance. Among those children who have ever used Medicaid for medical services, 10 percent have parents who found it somewhat difficult or difficult to use. Using Medicaid for dental and mental health services may be more challenging. For children who have ever used it for dental and/or mental health services, 19 percent have parents who found it somewhat difficult or difficult to use for dental care; the same share 19 percent found it somewhat difficult or difficult to use for mental health care. The receipt of services as well as use of Medicaid to cover the costs of services also differs depending on the pre-adoptive parent-child relationship. Children adopted by relatives are less likely to have received mental health services in the last 12 months than those adopted by non-relatives (24 percent compared with 36 percent). Neither receipt of medical services nor dental/orthodontia services differ depending on relative status; but the use of Medicaid to pay for such services received does. The percentage with a parent who ever used Medicaid to obtain dental or orthodontia care for the child is larger for those adopted from foster care by relatives than by nonrelatives (65 percent compared with 52 percent), but the reverse is true for having used Medicaid to obtain mental health care for the child (20 percent for those adopted by relatives, compared with 35 percent for those adopted by non-relatives). The group that did not use Medicaid to cover such services includes both those who did not receive such services at all as well as those who received services but used other sources to pay for them. Thus, these differing patterns may be due not only to services covered by Medicaid, but to the likelihood that each group seeks out and receives care. Indeed, looking at those children who did receive mental health care in the 12 months prior to the survey and who are covered by Medicaid, 97 percent of those adopted by relatives had Medicaid cover all or most of the cost, compared with 78 percent of those adopted by non-relatives. Post-adoption supports include an array of services that children and families may receive after the adoption is finalized (Vandivere et al., 2009). In this section, we separately discuss adoption-specific supports, including a range of services targeted specifically at adopted children and their families, and more general supportive and rehabilitative services not specific to adoption. The adoption-specific services include parent training, meeting with someone at the agency, attending a parent support group, attending a child support group, and receiving respite care. While respite care is a service often used by parents of children with special health care needs, regardless of adoptive status, we include it here as an adoption-specific support because it is also used by adoptive parents of children who have been abused or neglected and because its provision is intended to help prevent dissolution. As shown in Figure 7, the most commonly received adoption-specific supports are participating in parent training (38 percent), meeting with someone from the adoption agency to discuss post-adoption services (36 percent), and participating in parent support groups (29 percent). Two less common services are participation in support groups for children and respite care; 10 percent of children ages 5 and older have ever participated in a support group and 9 percent of children have a parent who has ever used respite care. Sometimes parents may not receive a post-adoption service that they wanted for themselves or for their children. This is the case for a minority of children adopted from foster care. Interestingly, while only 10 percent of children adopted from foster care have participated in support groups for children ages 5 and older, an additional 17 percent have parents who wanted them to. Respite care is another service not frequently received yet more commonly desired. While 9 percent of children have received respite care, an additional 15 percent have parents who wanted respite care. Response categories included service exists but inaccessible to the family, service doesnt exist, parent has no knowledge of the service, and lacked the service because of cost. Captured within the first category are children whose parents that services were too far away, that they didnt have time for the service or because of conflicting schedules, that the child didnt want the service, that the childs behavior prevented them from participating in the service, because the program was full, or because the family was not qualified for the service. The second category included the agency not offering the service and the program or service not being in close proximity to the family. The third category included children whose parents did not know where to find the services. Even for post-adoption services that are more commonly received, including parent training, meeting with someone from the agency, and parent support groups, a notable share of children between 9 and 13 percent, depending on the type of service have parents who want to receive the service but have not. Looking across the five adoption-specific services, 42 percent have not received at least one needed support. Combining the percentages of children who received a service and those with parents who want a service provides some indication of the overall potential demand for each service. Doing so indicates that between 42 percent and 50 percent of children adopted from foster care have parents who are interested in receiving each of the five services and supports. The perceived helpfulness of each specific service does vary, although most children who have received a particular service (between 86 percent and 100 percent, depending on the specific service) have a parent who does feel that it was somewhat helpful or very helpful. Many adoptive families receive other family supportive services not specifically related to adoption. (See Figure 8.) Among children ages 5 and older who were adopted from foster care, close to half (46 percent) have received mental health services, nearly four out of ten (39 percent) have received tutoring, and almost one out of five (18 percent) have received mentoring. Additionally, among all children under age 18 who were adopted from foster care, 23 percent have received family counseling, and 16 percent have received assistance in paying for child care. Less common services include psychiatric residential treatment or hospitalization for those ages 8 and older, drug and alcohol services for adolescents, and crisis counseling. As is the case with adoption-specific services, some children have not received certain services but have parents who wanted them to (also shown in Figure 8). For instance, while 16 percent of children have received child care assistance, an additional 19 percent have a parent who wanted such assistance. More than one out of ten children have parents who wanted a mentor (14 percent) or a tutor (12 percent) for their child but did not receive these services. Across all the services, 39 percent of children failed to receive at least one service desired by their parent. For children whose families have received child care assistance, almost all of their parents felt the assistance was very helpful (92 percent). The vast majority of children receiving tutoring and mentoring have parents who found the services very helpful or somewhat helpful (52 percent and 40 percent, respectively, for tutoring and 69 percent and 25 percent for mentoring). Due to the small number of children receiving crisis-oriented services such as alcohol and drug services and crisis counseling, estimates for their perceived helpfulness are unreliable. There are a variety of reasons that families who want services might not receive them, and some families might fail to receive services for multiple reasons. (See text box.) Looking separately at children who did not receive at least one of several adoption-specific services and at children who lacked at least one of several general supportive services, Figure 9 presents various reasons for lacking at least one needed service. As shown, over half (55 percent) of children who did not receive at least one needed adoption-specific service have parents with no knowledge of the service; for nearly half (46 percent), a service has not been received because it does not exist, according to their parents. Considering general supportive services, rather than adoption-specific services, 30 percent of children who lack at least one needed service have not received it because of their parents lack of knowledge of the service; for 33 percent, the service does not exist. For a substantial share of children who did not receive a needed general service, the problem was not that the service did not exist or that costs were prohibitive, but rather that the family could not access the service. This was true for 61 percent of children; their families reported not being able to access services for various reasons; for example, parents indicated that services were too far away, that they did not have time for the service or because of conflicting schedules, that the child did not want the service, that the childs behavior prevented them from participating in the service, because the program was full, or because the family was not qualified for the service. In contrast, among those who lack an adoption-specific service, 36 percent have a parent who believes the service exists but who has been unable to obtain it for various reasons. Cost is a barrier for 19 percent of children lacking a general supportive service, but cost was reported so infrequently as a barrier to receipt of adoption-specific services that a reliable percentage estimate cannot be generated. Families who have received services learn about them through a variety of sources. As shown in Figure 10, we group these sources to distinguish child welfare-related sources, including adoption social workers, agencies and attorneys, from more general sources of information such as a childs school, medical professional, adoption websites and listservs, as well as other adoptive parents. More than six out of ten children adopted from foster care (63 percent) who have received at least one adoption-specific service or support have parents who heard about at least one of those services from the child welfare related sources; this is true for slightly more than one third (36 percent) of those who received at least one general supportive service. For children receiving adoption-specific services and general supportive services, 45 percent and 83 percent, respectively, have parents who learned of at least one of these services from sources other than the child welfare agency. Service receipt also differs by the presence of special health care needs, with the percentages receiving family counseling and mentoring higher among those with such needs than without (29 percent compared with 15 percent for family counseling and 23 percent compared with 12 percent for mentoring). There are also some differences by race/ethnicity of the child. Specifically, non-Hispanic black children are more likely to receive child care assistance than non-Hispanic white or Hispanic children (27 percent of black children compared with and 13 percent of white children). However, black children are less likely to receive family counseling than white or Hispanic children (12 percent compared with 25 percent and 31 percent, respectively) but more likely to have parents report not wanting the service (81 percent compared with 64 percent and 65 percent, respectively). Finally, children who receive a subsidy payment are more likely than children who do not receive a subsidy to receive mental health services and child care assistance. Parent characteristics. Children adopted by their former foster parents are more likely to receive mental health services than children adopted by non-foster parents (52 percent compared with 34 percent).This difference might be at least partly explained by the older ages of children adopted by foster parents, since mental health care service use is more common for older than younger children. Children adopted from foster care by relatives and non-relatives are equally likely to receive family counseling and mentoring. However, the percentage of children who have not received mentoring, but whose parents have wanted them to, is higher among children adopted by relatives than among those adopted by non-relatives (25 percent compared to 11 percent). Household characteristics. Service receipt also sometimes differs by U.S. census region. Receipt of several different services is more common among children residing in the West compared with children in other regions. (See Figure 12.) The most notable difference is in receipt of mental health care (65 percent in the West compared with 39 percent, 45 percent, and 41 percent, in the Northeast, Midwest, and South, respectively) and family counseling (43 percent in the West compared with 11 percent, 23 percent, and 18 percent, in the Northeast, Midwest, and South, respectively). However, receipt of child care, residential treatment, mentoring, and tutoring do not differ by geographic region. Whether or not the child lives in an urban or suburban area rather than a rural area is associated with receipt of some services. Specifically, children adopted from foster care who live in urban or suburban areas are more likely than those who do not to receive training for the parent, a support group for the parent, and crisis counseling. Children living in families with household incomes greater than four times the poverty threshold are less likely to receive mentoring than those living in families with lower household incomes. In addition, receipt of respite care is more common among children living in families with household incomes at or below four times the poverty threshold than among children in families with larger household incomes. However, not receiving yet desiring respite care is more common among children living in families with higher household incomes (23 percent compared with 12 percent). Children adopted from foster care may receive a variety of post-adoption supports, including monthly adoption subsidy payments, Medicaid insurance coverage, and other supports and services. Ninety-two percent of children have adoption agreements with the public child welfare agency, and over three-quarters (78 percent) of children adopted from foster care receive a monthly subsidy payment. While the vast majority (88 percent) of children have parents who would have adopted the child without the payment, a minority (12 percent) have parents who feel the adoption would not have been likely or would have been very unlikely in the absence of the subsidy. While many families might have been willing to adopt without the subsidy, because nearly half of families adopting children from foster care are in low income households, the subsidies undoubtedly lower the financial stress of the adoption and allow them to provide better homes for their adopted children. Recent findings show that, at least on some measures, children adopted from foster care at ages 6 and older experience have parents who report lower well-being and adoption satisfaction than children adopted from foster care at younger ages (Malm, Vandivere, and McKlindon, 2010). Given this, it is perhaps not surprising and somewhat reassuring that children ages 6 and older at time of placement are more likely to receive a range of therapeutic and supportive services compared to children placed at ages 5 or younger. However, many children adopted at ages 6 and older have parents who want certain services yet do not receive them, in particular, child support groups and tutoring. Findings on the receipt of post-adoption services indicate that not every adoptive family receives or wants to receive every post-adoption service. However, substantial shares do receive and/or want to receive a number of post-adoption services. Overall, 35 percent of children adopted from foster care did not receive at least one adoption-specific support their adoptive parents thought would have been helpful. Clearly, many adoptive families are utilizing and/or seeking these adoption-specific supports. Yet the data also suggest that substantial percentages of children have parents who indicate that some needed services (either adoption-specific or general supportive) are either unavailable, or parents did not know of them. Findings also indicate that adoptive parents do often learn of adoption-specific services from child welfare sources, but that non-child welfare sources frequently provide information about general supportive services. This may indicate a need for greater awareness of community resources not specific to adoption, such as family counseling, tutoring, and child care among child welfare agency workers and the need to share this information with adoptive parents. Adoption subsidies and Medicaid are by far the most common supports received by children adopted from foster care. But a wide variety of both adoption-specific and more general services are utilized by substantial percentages of children. In the case of seven services specifically asked about in the survey, between 10 and 20 percent of childrens parents indicated that they desired but did not receive the services. These included tutoring, mentoring, child care assistance, parenting training, parent support groups, child support groups and respite care. Making such services accessible to more adoptive families could address the stress and isolation often experienced by children adopted from foster care and their adoptive parents. Hughes, D.A. 1999. Adopting children with attachment problems. Child Welfare, 78(5):541-560. Malm, K., Vandivere, S. and McKlindon, A. 2010. The National Survey of Adoptive Parents: Children Adopted From Foster Care, Part I: Child and Family Characteristics, Adoption Motivation, and Well-Being. Washington, DC. Office of the Assistant Secretary for Planning and Evaluation, U.S. Department of Health and Human Services. National Resource Center for Permanency and Family Connections, 2007. Respite and crisis Care. FRIENDS Fact Sheet #14. Retrieved from http://www.archrespite.org/docs/FRIENDSfactsheet14-Respite.pdf, October 1, 2010. North American Council on Adoptable Children (NACAC). (2008). The value of adoption subsidies: Helping children find permanent families. Accessed August 23, 2010 at: http://www.nacac.org/adoptionsubsidy/valueofsubsidies.pdf. Vandivere, S., Malm, K., and Radel, L. (2009). Adoption USA: A Chartbook Based on the 2007 National Survey of Adoptive Parents. Washington, D.C.: The U.S. Department of Health and Human Services, Office of the Assistant Secretary for Planning and Evaluation, 2009. Riggs, D., (2003). Plan, prepare, and support to prevent disruptions. North American Council on Adoptable children. Retrieved from: http://www.nacac.org/adoptalk/planpreparesupport.html, October 1, 2010. Strijker, J., Knorth, E.J., and Knot-Dickscheit, J. 2008. Placement history of foster children: A study of placement history and outcomes in long-term family foster Care. van den Dries, L., Juffer, F., van IJzendoorn, M.H., Bakermans-Kranenburg, M.J. 2009. Fostering security? A meta-analysis of attachment in adopted children. Children and Youth Services Review, 31(3): 410-421. Experiences of adopted children and youth including histories of abuse and neglect, later age of adoption, prenatal drug exposure, and placement in multiple foster homes prior to adoption have been identified as risk factors for symptoms of attention-deficit hyperactivity disorder (ADHD) and oppositional defiant disorder (ODD) (Simmel et al., 2001). Attachment disorder, which can result from extremely neglectful care very early in life, is also a particular concern for adopted children who entered care due to severe neglect and/or who experienced multiple foster care placements early in life and for some internationally adopted children who received insufficient care in orphanages for example, see: Howe and Fearnley, 2003.; Hughes, 1999; Strijker, et al., 2008; van den Drieset al., 2009). The survey questions asked about families receipt of subsidies and did not distinguish between those which were paid entirely with state funds and those that were paid with a combination of federal and state funds, i.e. under the federal title IV-E program. An adoption agreement was defined as an agreement made before the finalization of the adoption that may include monthly maintenance payments from the agency, medical coverage, and other services such as therapy. To help encourage the adoption of special needs children, federal subsidies were created by Congress through Public Law 96-272, the Adoption Assistance and Child Welfare Act of 1980. A child may receive a federally funded adoption subsidy under Title IV-E or a state funded adoption subsidy (non-Title IV-E) based on each state's guidelines. A child may be deemed special needs and be eligible for an adoption subsidy based on a variety of guidelines that are unique to each state. Some of the guidelines that help determine a child's eligibility include: age, sibling group status, medical, mental and emotional disabilities or minority group status. See http://www.childwelfare.gov/pubs/f_subsid.pdf. A reliable estimate of the percentage of children who used tutoring that was provided for in the adoption agreement cannot be generated, due to sample size limitations. The numbers reporting use of residential treatment services that was covered by an adoption agreement and that was not covered by an adoption agreement were too small to yield reliable percentage estimates. The number of children with parents who responded that they had ever received an adoption subsidy but were not currently receiving a payment was so small that a reliable percentage cannot be calculated. The North American Council on Adoptable Children (NACAC) has state-by-state information on monthly adoption subsidy payments. See http://www.nacac.org/adoptionsubsidy/summary.html. All differences cited in the text are statistically significant at the .05 level, unless otherwise noted. Among children adopted from foster care, the percentage receiving a subsidy does not differ between those adopted with birth siblings and those who have birth siblings not adopted by their parents. Regardless of whether the parent became a foster parent intending to adopt or not, the child was more likely to receive an adoption subsidy. This difference is statistically significant at the 90 percent confidence level. Difference is significant at the 90 percent confidence level. E.g., see: Riggs, 2003; National Resource Center for Permanency and Family Connections, 2007. To assess whether services that were desired were not received, the NSAP asked: Did you ever need this service since adopting [the child]? and Why didnt you receive this service that you needed? The difference for crisis counseling is statistically significant at the 90 percent confidence level. A comparable, reliable estimate cannot be generated for Hispanic children. The difference for Hispanic children is significant at the 90 percent confidence level. Among children who receive a subsidy, 54 percent have received mental health services, compared with 29 percent of those who do not receive a subsidy. Among those who receive a subsidy, 20 percent have received child care assistance; a reliable, comparable percentage estimate cannot be generated for those who do not receive a subsidy due to sample size. This difference is significant at the 90 percent confidence level. Twenty-two percent of children in families with household incomes below four times the poverty threshold have had a mentor. A comparable, reliable estimate cannot be generated for children in families with higher household incomes. Ten percent of children in families with household incomes below four times the poverty threshold have received respite care. A comparable, reliable estimate cannot be generated for children in families with higher household incomes.